WHAT IS TOTAL TRUCK CENTERS™? Access exclusive marketing support by registering as a Total Truck Centers™ retailer! Our digital and print news pieces deliver need-to-know information right to your inbox or mailbox. 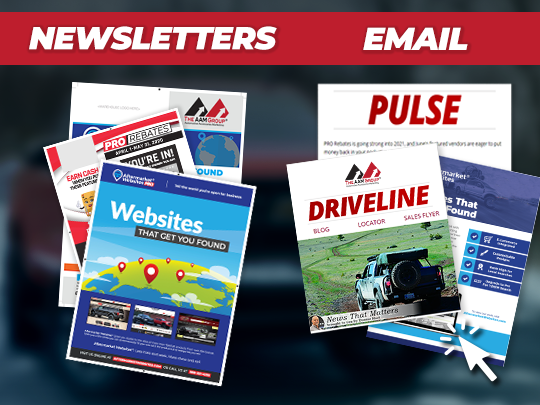 The Driveline™ email offers interesting industry developments, rebates and special offers, glorious "epic fail" videos, and new products. 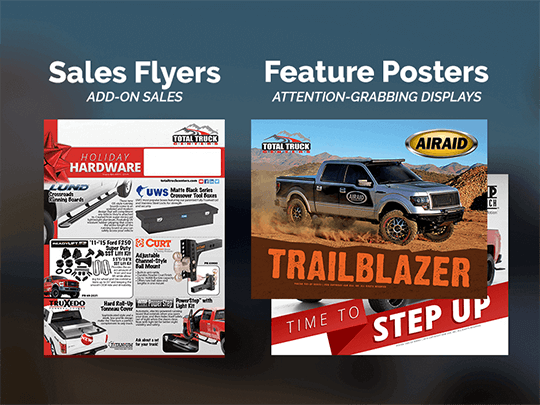 The Trailhead™ newsletter communicates smart business strategies and tips to get the most out of Total Truck Centers' marketing tools. Sign up for free or let our program sales team help sign you up effortlessly at (888) 251-4252! Total Truck Centers' video series make becoming a product expert easier than ever! 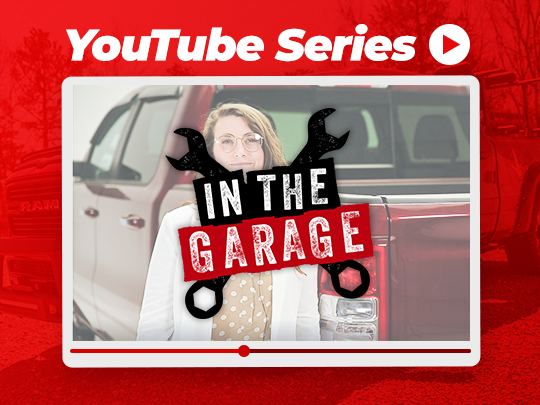 Our In the Garage™ YouTube videos walk you through installations of the industry's hottest new products. For more in-depth explorations, we partner directly with our sponsoring manufacturers to create exclusive video tutorials, which describe the what, why, and how of a particular product—plus tips to sell and quizzes to test your knowledge! Watch any time at youtube.com/totaltruckcenters! Want more? Let our program sales team help you get more today at (888) 251-4252! Total Truck Centers™ maintains an online catalog of POP displays offered by our manufacturing partners. These in-store marketing materials grab your customers' attention, provide hands-on product education, and help you create a more dynamic sales environment. You'll learn what displays are available and how to get them. 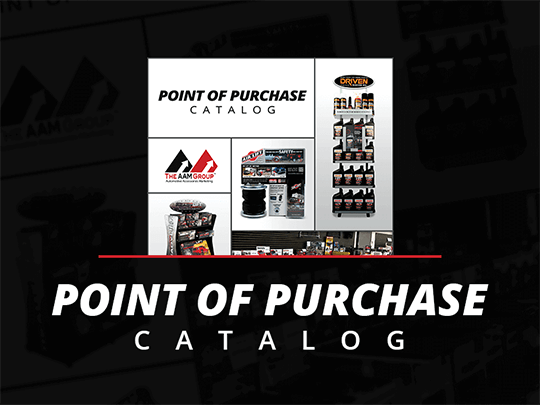 Click the link below to view the most current edition or let our program sales team help you get all of your merchandising needs at (888) 251-4252! Printed five times per year, our 16-page sales flyers present the hottest deals going. Available in different price structures and with your custom imprint, sales flyers are a great way to build add-on sales, generate impulse buys, and deliver professional, no-hassle printed show pieces to your customers. As a subscriber, you’ll also receive two accompanying posters with each print period: one featuring a dynamic lifestyle image with lasting appeal and one with select products from the current sales flyer without pricing. Let our program sales team help you get the most out of your sales flyers at (888) 251-4252! These 5.5" x 8" full-color booklets focus on each of the five major truck/SUV brands: Chevy/GMC, Ford, Jeep, Ram, and Toyota. Packed with platform-specific accessories, VSBs get customers dreaming big when it comes to modifying their vehicles. Subscribers get 500 catalogs for each line every year, so you can leave them on seats after installation services or hand them out in store to excite your customers! View them online here or let our program sales team help you get the most out of our tools at (888) 251-4252! 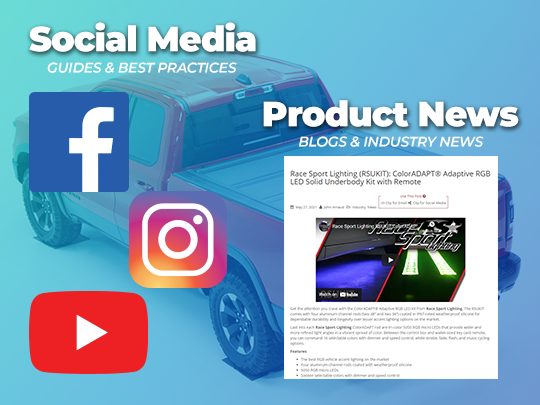 Product News is your destination for the industry’s hottest products, educational videos, and sales-closing rebates. Plus, every news entry has links you can click to reuse the content as your own in your email and social media campaigns. Speaking of connecting with your customers, our informational guides help you take your social media efforts to the next level, with step-by-step instructions on how to get the most out of Facebook, Instagram, and Google My Business. 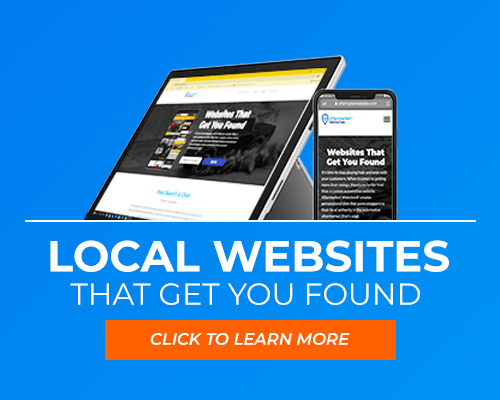 Own your local market with a custom website. Aftermarket Websites™ is a website-building service just for Total Truck Centers™ retailers. In just 15 days we can build you a site that will get you found by local shoppers, drive in-store traffic, and put your business on the map. We even load products and images for you, so potential customers can find your store based on the brands and categories you sell. Contact us today for a no-obligation consultation at (888) 251-4252! Email marketing made fast and simple. 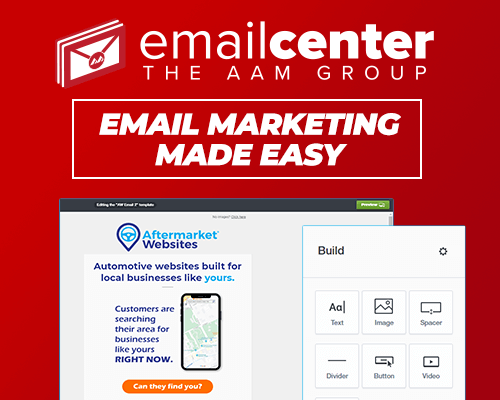 Email Center™ helps you quickly create and send email that communicates new products, hot deals, and other information to get customers back in your door. The service lets you send unlimited emails and offers time-saving tools like prepared templates, drag-and-drop editing (no technical knowledge required! ), the ability to bill and accept payments through email, list management, one-on-one support, and much more. Email Center™ is available with a Total Truck Centers™ Platinum membership. Go here to sign up! Earn cash back when you buy from your distributor. 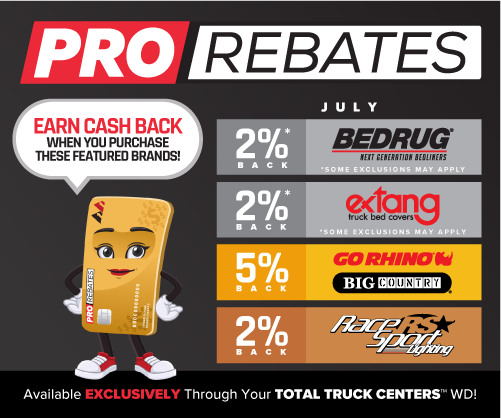 Offered exclusively through your Total Truck Centers™ warehouse distributor, the PRO Rebates™ program gives you cash back on your purchases of certain vendors during special promotional periods throughout the year. With rebates ranging from 2 to 5%, the more you buy, the more you get back! Rebates are automatically mailed to you in the form of prepaid Visa debit cards to spend as you see fit. 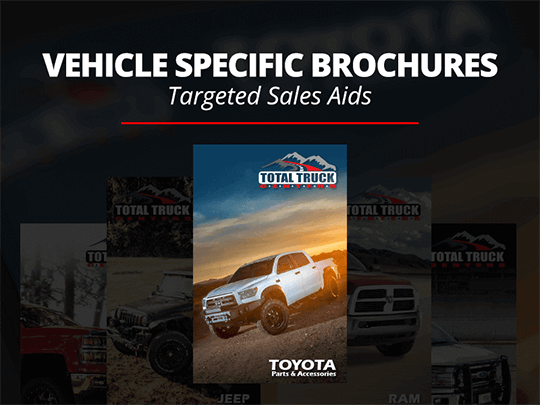 The Total Truck Centers™ program offers benefits—many of which are free—designed to give independent retailers of truck and SUV accessories the tools and resources they need to stay informed, improve their sales processes, attract more in-store traffic, and sell more parts. Our program addresses your need for better marketing by providing resources and services that take less of your time, are easier to use, and are specifically designed to meet the needs of local business persons. Total Truck Centers™ is a unique program in that it is brought to you by your AAM member warehouse and dozens of sponsoring vendors, who have all invested to help make you more successful. The Total Truck Centers™ program is part of The AAM Group™ (Automotive Accessories Marketing™ USA, Inc.), an organization that’s been helping local accessory retailers for nearly 30 years. You are not alone: Total Truck Centers™ is committed to bringing you industry-leading marketing capabilities. So what are you waiting for? Sign up today for exclusive benefits to help make your store become a stronger local authority!